ITS THE ‘MAY’ FACTOR AT PLAY – 14/05/2010. MAY FACTOR – FEAR FACTOR. What else can one say, the May month certainly brings with it lot of Volatility, besides uncertainty. This fact has been well documented over the past 15 years and there are lots of willing traders who will readily testify as they have burned their fingers besides losing their hard earned capital. The Volatility was very low for the past two months and just as the month started, it started to increase. The market has been playing in accordance with the global market, which are rocked by newer problems everyday. The week started on a positive note when the $1-Trillion bailout package was announced but the market was not lucky enough to end on such a positive note as the fear about European crisis spreading gained credence and panic in the US market adding more fuel to the fire. Sometimes I feel that May is really the right time to go for a vacation. IIP GOOD, BUT LOWER THAN EXPECTED. Weighed down by a hike in interest rates and partial withdrawal of stimulus measures, the IIP came in lower than expected at 13.5% v/s market expectation of 15%. This is the 6th consecutive month where the industrial output has posted a double digit growth. Looking at the number and the slight fall in April inflation figure, it is unlikely that the RBI will continue with further interest rate tightening policy. It will wait for cues on growth and demand in the economy and overall global economic situation before taking any policy action. MARKET REBOUNDS ON $1-TRILLION BAILOUT PACKAGE. Our market started the week on a positive surprise when it bounced back sharply on Monday. This was after the European Union agreed on a $ 1- trillion Euro rescue package to bailout debt-ridden European countries like Greece and Poland. The main idea behind announcing the bailout package was to stop the fear contagion from spreading further, besides of course bailing out and providing relief to the weak European nations. This led to a global recovery and our market followed suite. Short covering helped the Sensex to jump by over 550 points and Nifty by 70 points. Hence the recent low made by the Sensex (16684) and Nifty (4985), assumes significance as it will act as a temporary bottom. Only if the above mentioned levels are breached, can one expect the market to continue with its downward correction and test the lower boundaries of the channel in which the market is moving i.e. Sensex – 15969 and Nifty - 4810. The Sensex opened the week at 16799, made a high of 17389, a low of 16799 and closed the week at 16994. The Sensex gained 225 points on a weekly basis. Similarly Nifty opened the week at 5026, made a high of 5212, a low of 5026 and closed the week at 5093. The Nifty too closed with the week with a gain of 75 points. The candle formations on the weekly and daily charts are slightly complex and contradictory. Both Sensex and Nifty have formed an Inverted Hammer on the weekly charts but there is no gap between the previous weeks and this weeks body. There is a long upper shadow which is due to the selling pressure observed by the end of the week. If we consider last two weeks pattern formation together, then there is Bullish Harami pattern which is a bullish reversal pattern. On the daily charts, both Sensex and Nifty have formed a Bearish big body black candle on Friday. In Nifty, the pattern formed is Bearish Engulfing, suggesting a stop in the current upmove, whereas the Sensex has formed a Bearish Evening Star Reversal pattern. The daily charts suggest bearishness, whereas the weekly charts are providing a glimmer of hope for the Bulls and that will be possible only if the market does not breach its previous weeks lows. All the oscillators like the ROC, MACD, RSI, Stochastic Oscillator and OBV continue to be in Sell mode. The Directional Indicators too continue in their Sell mode as the –DI continues to be higher than the +DI. In the last weeks fall, both the indices took support at the trendline joining the July 2009 low to Feb 2010 low (Sensex 13219-15651 and Nifty 3918-4675). 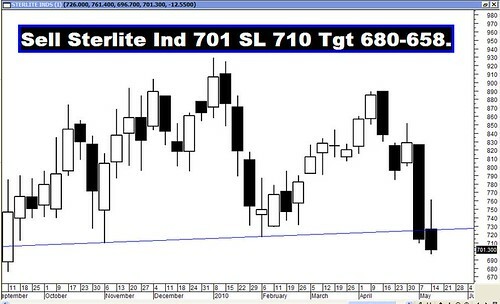 This trendline currently falls at Sensex – 16771 and Nifty – 5022 and should act as a strong support. Only if this trendline support is breached, should the indices test the bottom of the rising channel in which they are currently moving. Trendline acting as the bottom of that channel falls at Sensex – 15969 and Nifty - 4810. Both the Sensex and Nifty are trading below their intermediate lows and hence both are in a short and medium term downtrend. Last week both the indices were moving in a range provided by the 50dma and 100dma. The market used to take support at 100dma and the 50dma was providing resistance. Nifty was trading between 100dma (5116) and 50dma (5219), before decisively breaking the small trading range when it closed below the 100dma on Friday. Now the 200dma will be tested for support which falls at Sensex – 16709 and Nifty – 4981. The 200dma for both Sensex(16709) and Nifty (4981) are actually coinciding with the demand trendline (Sensex-16771 and Nifty-5022) which provided support last time around and the immediate previous lows (Sensex-16684 and Nifty-4984). Hence the Support Zone for the Sensex 16684-16771 and Nifty 4981-5022 is critical and should not be breached if the further upmove is to continue. In the immediate future Sensex is correcting its rise from 15651 to 18047 and the correction levels are 17132-16849-16566. Similarly Nifty is correcting its rise from 4675 to 5399 and its correction levels are 5122-5037-4952. If the correction gets deeper then we will have to look at the correction of Sensex rise from 13219 to 18047 and the correction levels in that case will be 16203-15633-15063. Similarly one has to consider the Nifty rise from 3918 to 5399 and the correction levels will be 4833-4659-4484. Nifty OI PCR is at 1.20 and good call writing is seen at the 5200 and 5300 strikes which will provide strong resistance going forward. Put activity seems to be concentrated at the strikes of 5000 and 4800. These levels are expected to provide support in case the market falls further. For the week ahead, Sensex will find Support at 16771-16566-16203 and will find Resistance at 17276-17494-17646. For the week ahead, Nifty will find Support at 5022-4952-4856 and will find Resistance at 5160-5212-5269. Last week the market opened with a big gap up on the back of $1-trillion bailout package and hence all Sell recommendation stocks opened higher than their stop-loss and none of the trades could be executed.